The High Line Ariel View. The High Line—formerly known as the West Side Improvement—spread its urban-garden-wings to its highly anticipated 10-blocks unveiling of Section Two, just last week right before summer in New York officially begins. The new section continues its lower midtown path: starting from 20th Street to 30th—doubling its length to one mile. The previous freight-station-filled-trains, which used to be bustling with meat and produce deliveries into the meatpacking district, as well as the Chelsea Market, is now generating about a 2 billion dollar revenue, ironically replaced by luxury fashion brands and housing complexes designed by starchitecs. Section two of the elevated park overlooking the Hudson promises to be more lush: filled with wild plants and flowers next to some laid out grass—as to invite picnickers to stretch out onto the lawn—toning down its industrial subtext beneath the modern park design. Where as Section one, focuses more on showing off creative angles in the seating department—offering unique views of the city framed in unsuspected angles. This grand apple renovation, is an extreme makeover from the West Side Improvement that it once was—costing the city of New York about $112 million, down from a total of $153 million (the rest being made up of private investors within the community). However, less the total from a $2 billion revenue, no one can argue that this newly stamped NYC landmark has proven to be a smart and beneficial investment indeed—financially, as well as for the well being of the big city dwellers and tourists alike. 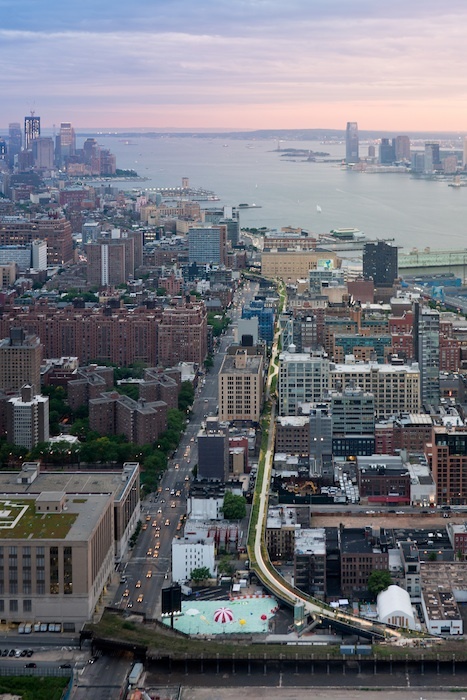 Take a guided tour of the New York owned space, in the making of the High Line by Co-founder Robert Hammond and Len Greco (from NYC Economic Development Corp, featured video right). Plus, check out the slide show (below,courtesy of Friends of the High Line) of the High Line.